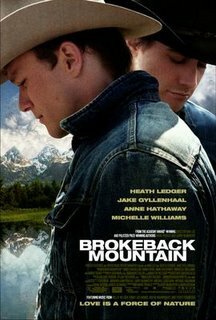 I can't even remember now when I'd first heard the two glorious words Brokeback Mountain. 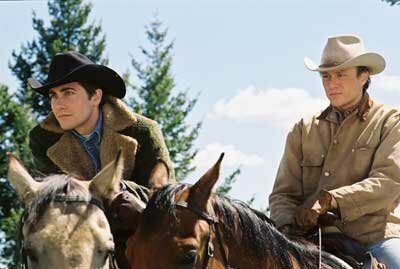 I believe it was sometime in early 2005, back when it was still in production, and being referred to as "the gay cowboy movie" with no chance at mainstream success. 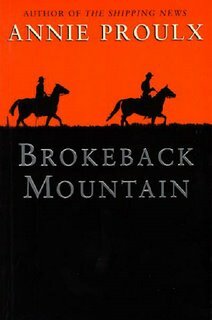 Upon hearing more about it, I read the short story by Annie Proulx after ordering it special from Amazon. I remember reading it all on one night in early August, and not being particularly enthralled by it the first time... it took some time to have an effect on me... and even then, I think, only because I'm (un)fortunately an old soul who's profoundly affected by sad stories about love and loss, the cruelty of the past, and the promise of lives never lived. When faced with a sad story about impossible gay love, naturally I couldn't resist its magic. I, like many, have been Jack Twist, and have also been Ennis, I suppose... both leave such an indelible mark on the psyche as perfect romantic archetypes, better represntatives of that breed than even Titanic's Jack and Rose. How fitting that Titanic Jack's Brokeback counterpart is also named Jack, and that Rose's Brokeback counterpart, while not named Rose, is named Ennis Del Mar, a Gaelic/Spanish construction of Proulx's that could be translated as "island of the ocean," a name not dissimilar to Titanic's "heart of the ocean," the mythical blue diamond that, while thoroughly and passionately pursued by many, was lost in the depths of the sea. How interesting also that, given the story's 1997 publication, it and the film Titanic must've been conceived during roughly the same time. It's no wonder Brokeback gave a nod to Titanic with its poster. The two films are soulmates, methinks. I first saw the film over winter break on the beach, with a friend of a friend, a girl. It didn't really hit me that first time, and that disappointed me more than a can say. But I of course later viewed it a second time, at which point the emotions came flowing out. My first time seeing it, my expectations ruled the day, and I couldn't help but disengage from the film in front of me. But my second time, I was able to let it just flow through me ("like rain", as Lester Burnham would say), and the impact of that gentle flow was massive. It seemed that Ang Lee had perfectly calibrated every frame and sound for maximum emotional impact without even breaking a sweat (unlike some oscar-winning films which shall remain nameless)... and that perfect calibration, I think, offended me at first. It seemed too perfect, too composed, until I let myself feel it. It's not unlike how I'm offended by happy people whose lives are in more order than mine, who know what they're doing, who're like well-oiled machines, until I get to know them and realize how hard they worked to make themselves that way. This film took hard work. It took mind, heart, and soul, and hence it touches all three in turn. Sure, there are the slow bits... I suppose it's not a perfect film... but it's few imperfections seemed utterly necessary for the creation of what it did indeed achieve, and that achievement was massive. After falling in love with the film on a second viewing, I savored my Brokeback Mountain soundtrack (to which I still listen nearly every day) and the story-to-screenplay collector's book that I promptly had my parents buy me. I obsessed for months. I went through the "phases of loss" after oscar night, until finally arriving at acceptance. And I recently bought the film itself and received it just yesterday in the mail... having watched it yet again, I can ensure myself and others that it still has me in its magnetic pull. May we all be blessed and cursed by our own night under the full moon, with that soon-to-be-soulmate beside us. Whether real, imagined, or somewhere in between, such predicaments are what I live and die for. ...and most everything else. Ennis & Jack forever. I love you. i cant get over heath death ! !